Komplex ruandai bourbon kávé, melynek ízjegyeiben megtalálható a ribiszke, csonthéjas gyümölcsök, kései meggy és csokoládé. Complex Rwandan bourbon coffee, with red currant, stone fruit, black cherry and chocolate in the flavour profile. Mahembe is a privately owned washing station, owned by Justin Musabyiama who is also growing his own coffee trees. Justin has grown up in the local area and after moving away for some time decided to come back home and invest in the community he was from by building a wet mill on his father’s coffee plantation. He has an 8-hectare farm of his own, and is buying cherries from the surrounding smallholders. 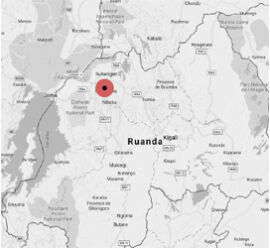 This area is not as well known for quality coffees as some other parts of Rwanda but has great altitudes and an increasing number of farmers growing coffee at the higher altitudes. Nevertheless, we have found this coffee to be unique, with differences from other coffees in Rwanda in general, and with great potential.